A weeklong series on the art of entertaining, for women who are too busy for Pinterest. You’ve done it again. You spontaneously invited all of your phone contacts over for an impromptu party in your apartment. Gulp. You totally did not realize everyone would be available so last minute. Your apartment is a mess and this is suddenly feeling like such a bad plan. But fear not! Once you’ve got all the crudité cut up, the beers successfully chilling in the fridge, and pounds of ice and alcohol lugged home on your back, all you need is a quick cleanup. 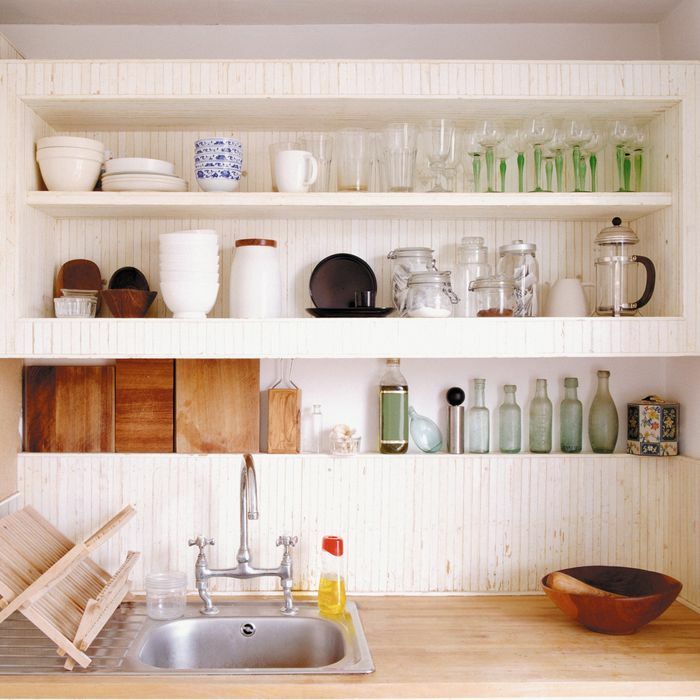 1) Declutter countertops. Clean surfaces are an easy way to convince people you’re all feng shui and minimalist. Grab a shoebox or container and toss in any floating knick-knacks, small electronics, or pen collections — even picture frames. Keep the box in the bottom of your closet for now and if you don’t tend to it soon after the party, consider letting the contents go. Maybe they’re not that important after all. 2) Close all open doors, drawers, and toilet seats. It’s crazy how much of a difference this simple trick can make. Tucking away = tidiness. Creating an awareness and habit of shutting drawers and doors is one of the easiest ways to make your home feel more organized. 3) Clean your bathroom mirror. Since you don’t have time to clean your entire bathroom, give the mirror a quick spritz and wipe down. This move will make the entire bathroom feel much tidier. And let’s be real, the guests are bound to notice a filthy mirror when they look hard into that thing on their bathroom break. 4) Hide dirty dishes in the oven. A sink full of dirty dishes is a dead I’m-secretly-a-mess giveaway. The oven is a great hideaway — just make sure this trick doesn’t become a new habit. 5) Conceal your clothing mound. Since hanging and folding clothing can be an all-day affair, pile up your loose garments and cover them with a throw blanket and some decorative pillows. Shuffle the mound into the corner of your room and pretend it’s supposed to be there. Beanbag, anyone? But really, don’t sit there. 6) Collect scattered papers and wrap them up with a rubber band. An immediate need for cleanliness is the only excuse for this lazy man’s method of dealing with papers and mail. But you don’t want to misplace anything important during your bash, so this temporary solution works for now. Write the date on a post-it note and attach it to the pile of papers so you can shame yourself into dealing with them once you’ve properly sobered up. 7) Light a scented candle and set up some flowers. Adding a good smell and something alive and green will make a space feel fresh and clean. So throw a simple flower into a jar or vase (setting a plant somewhere prominent works, too!) and light a few candles. Turn down the lights while you’re at it. Oh, look: Instant Zen. That’s it! Your cleaning blitz has come to an end and now it’s party time. Just make sure to ask your guests to take their shoes off at the door. Because no clean person allows shoes in their home. Am I right?